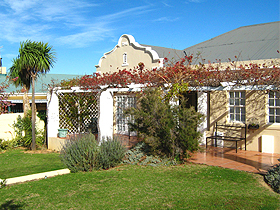 Double: R375 per person per night sharing including breakfast or R295 per person per night excluding breakfast. Single: R450 per person per night including breakfast or R370 per night excluding breakfast. Remember to indicate your preference between our self-catering or guest house suites. R50 per child for children under the age of 12. A 50% deposit is required before a booking can be held. (Forfeited in the event of cancellation within 7-days prior to arrival). Secure off-street car parking provided. Satellite TV in the communal lounge. Clock-Radio and TV in all rooms. No self-catering in main house. Double-click on the map to zoom in. Click and hold to move the map around. Alternate between Map, Satellite and Terrain views (top-right corner). FROM CAPE TOWN: Take the N2 over sir Lowry's pass. 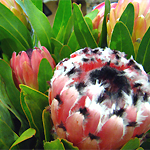 Turn into Grabouw at the Orchard Farm stall. Travel through Grabouw, over the river and take a left turn at the R321 to Villiersdorp/Franschhoek. Travel over Viljoen's pass, through Vyeboom and over the Theewaterskloof dam bridge and on into Villiersdorp. Cross over the first 4 way stop and turn left at the next turnoff. 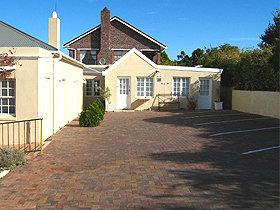 (Van Riebeeck Street) The B&B is on the left just before the next stop street.